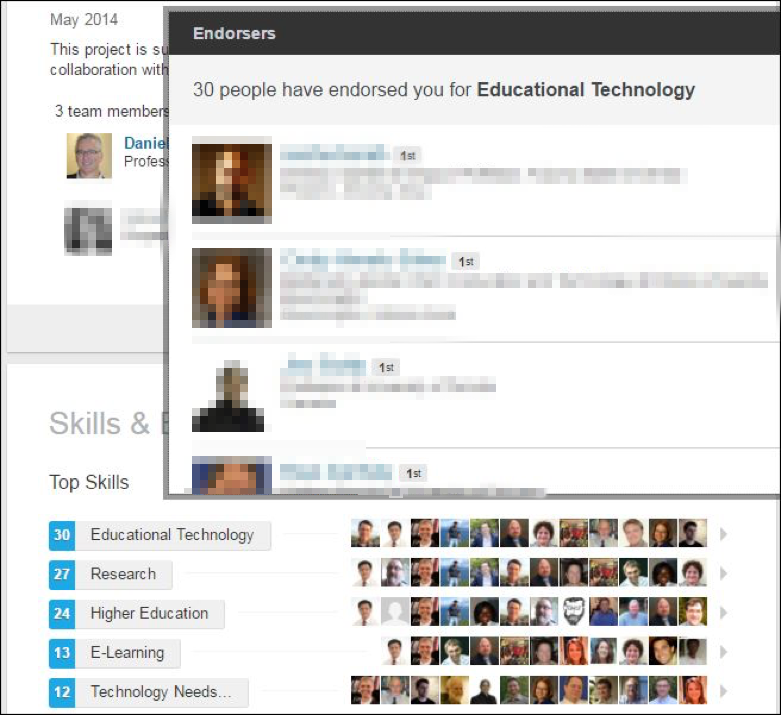 As most readers likely know, LinkedIn Endorsements (added in 2012) makes it simple to assign skills to peer profiles or endorse specific skills with a single click. Many also likely know that the Recommendations feature (added in 2006) makes it simple to ask for and give more general peer recommendations. Undoubtedly, many readers likely wonder about or dismiss the value of both features as meaningful evidence of someone’s learning and potential. We certainly had some doubts and many questions. Our starting assumption was that the value of these features for recognizing learning is highly contextual. This means that their value depends on factors such as one’s professional sector, professional status, and the relative status of endorsers and recommenders. We suspected that these features might actually work against some job seekers (because they used them poorly or inappropriately by overlooking or misrepresenting skills) but that they might be essential for others in landing an interview or consulting gig. We further assumed that a significant part of the $26B that Microsoft just paid for LinkedIn was associated with these learning recognition features. Readers might be unaware that LinkedIn has been investing heavily to make endorsements and recommendations more meaningful (and therefore valuable) to recruiters and employers. 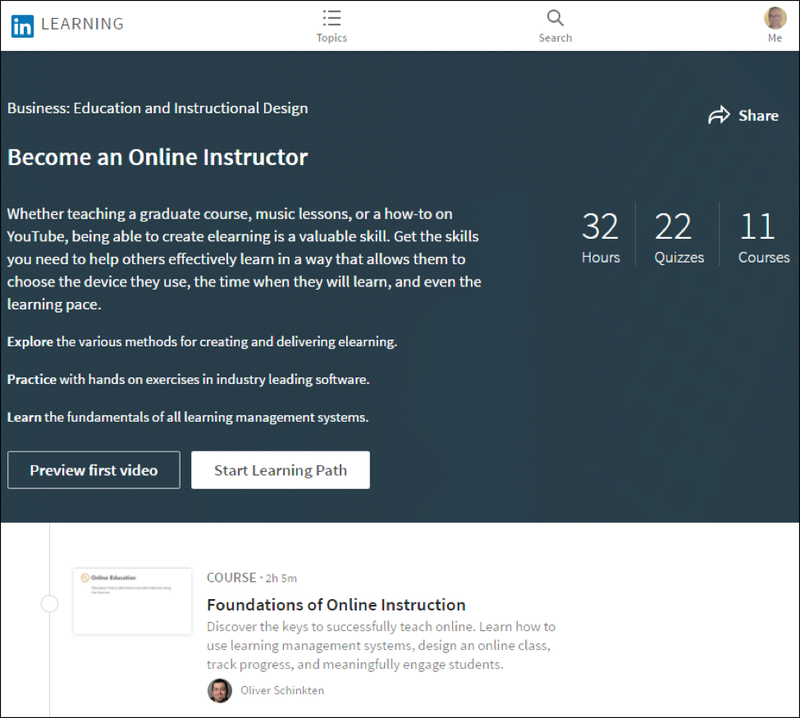 Many readers may also be unaware that LinkedIn went beyond recognizing learning to delivering learning when it acquired Lynda.com and its thousands of high-quality training videos in 2015. 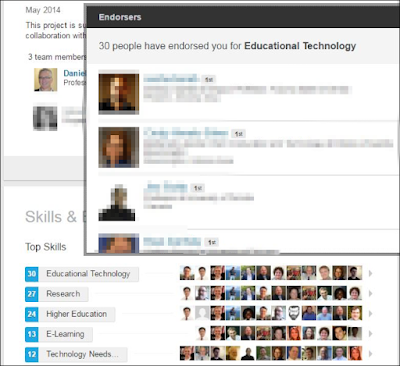 Given that endorsements and recommendations in any new Learning Recognition Network is likely to be considered in light of LinkedIn, it seems worthwhile to explore those features in LinkedIn in some detail. Dan is not really very active on LinkedIn. Like many academics, he keeps his profile current but has not done much networking on it, relying far more on email, personal connections. While he writes a lot of conventional letters of recommendation, he so far has only had one person request a LinkedIn recommendation. He has mostly ignored Skills and Endorsements and has sometimes endorsement prompts annoying. While he has responded to a few endorsement prompts, he does not even remember if he originated any of the skills on his own profile. 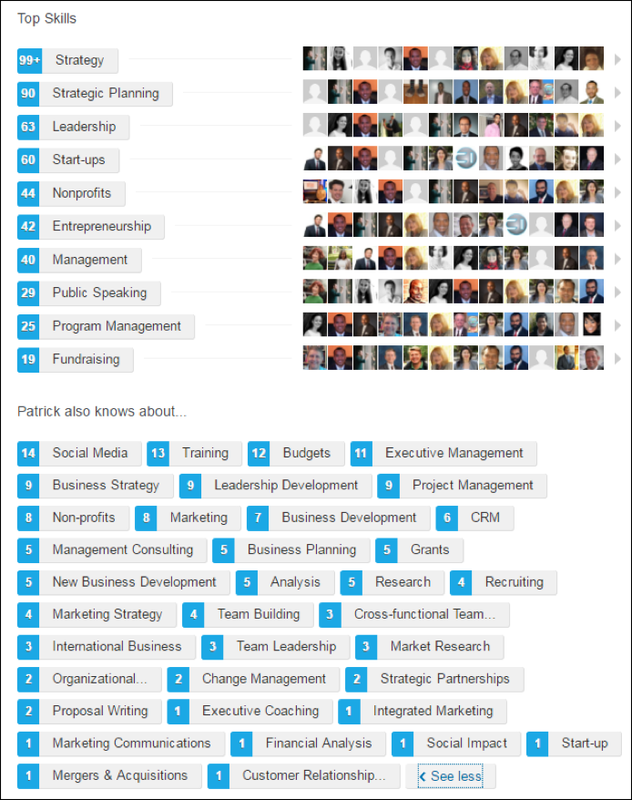 When he started writing this post he had 551 connections, 20 skills, and as many 30 endorsements (as shown above). While he regularly posted updates about previous blog posts on Twitter and Facebook, he never did so on LinkedIn. Dan currently has a little side project developing online professional development courses and digital badges for K12 network administrators. The project is starting to raise some challenges for User Interface Design that go beyond his expertise. So, Dan went to LinkedIn and entered that search term along with Distance Learning. That returned 3019 results. Even narrowing it to 2nd connections (people who are connected to somebody Dan is connected with) still returned 600 names. Narrowing it to 1st connections (people Dan is connected to) returns six people. One of them is Sonny Kirkley who Dan knows because he earned his PhD in Instructional Systems Technology at Indiana University and still lives and works in Bloomington. 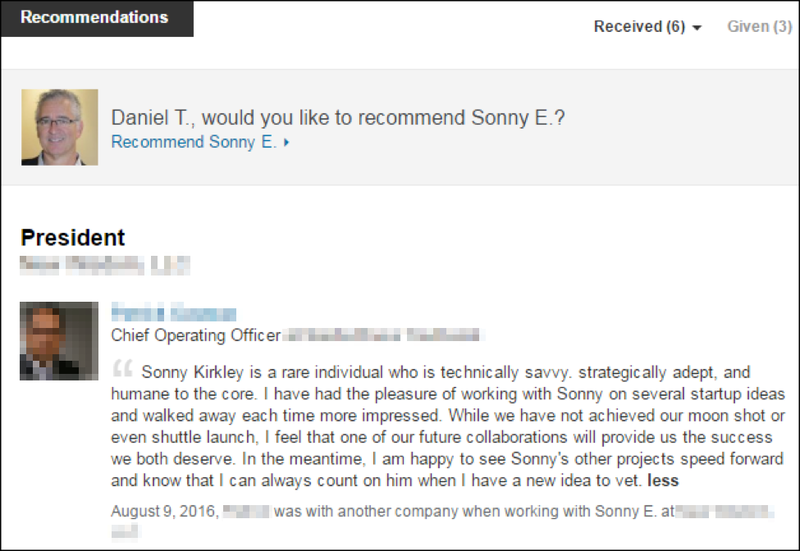 Sonny’s profile is an impressive eCredential with lots of relevant experience and education. Scrolling to the bottom of Sonny’s profile reveals that Sonny has six recommendations. We see that each is associated with a specific professional role and that Sonny has given three recommendations. Of course, Dan was asked if he wanted to give Sonny a recommendation. 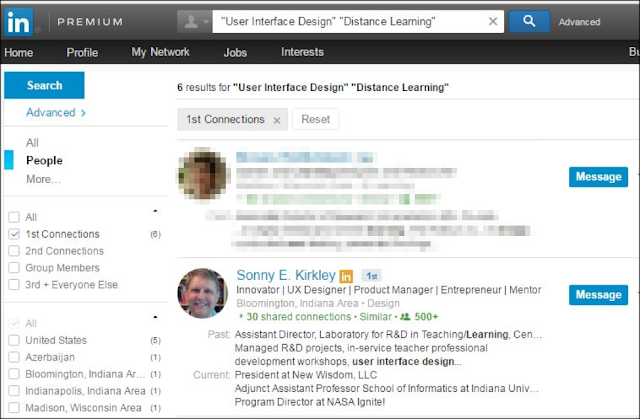 Affirming displays the thoughtful interface design which allows LinkedIn to quickly add the contextual information that adds value to the recommendation and automatically send a message to the connection regarding the recommendation. As shown, this interface makes it simple for recommenders to display (a) the role for which the connection is being endorsed, (b) the text of the recommendation, (c) the date of the recommendation, and (d) the relationship between the recommender and the connection. The first recommendation on Sonny’s profile came from someone who worked with Sonny in a similar capacity as Dan. While Dan does not know Sonny’s colleague who made the recommendation, clicking on the colleague’s profile revealed that he has given a modest number of recommendations (13) suggesting. So we know that the colleague does not post blanket recommendations to all of his 500+ connection. Dan also saw the while the colleague had over 100 endorsements for the skill of Strategy, here were few skills or endorsements for information technologies. This helps illustrate the differences in roles between the more general recommendations and the more specific endorsements. All of this information is helpful for pondering the value of the recommendations. Going back to the point of the first post in this series, the information around recommendations and endorsements facilitates highly contextualized professional discourse about competencies. Dan was able to readily “drill down” into the information as needed. This is the kind of discourse that characterizes conventional LRNs that were mostly analog (often over the telephone and more recently over email), regional, and slow. But with networked digital LRNs like LinkedIn, this discourse is digital, global, and fast. However, this begs the question, how does the speed and efficiency of LinkedIn impact whether these recognitions are trustworthy and trusted? Who Values LindedIn Endorsements and Recommendations? 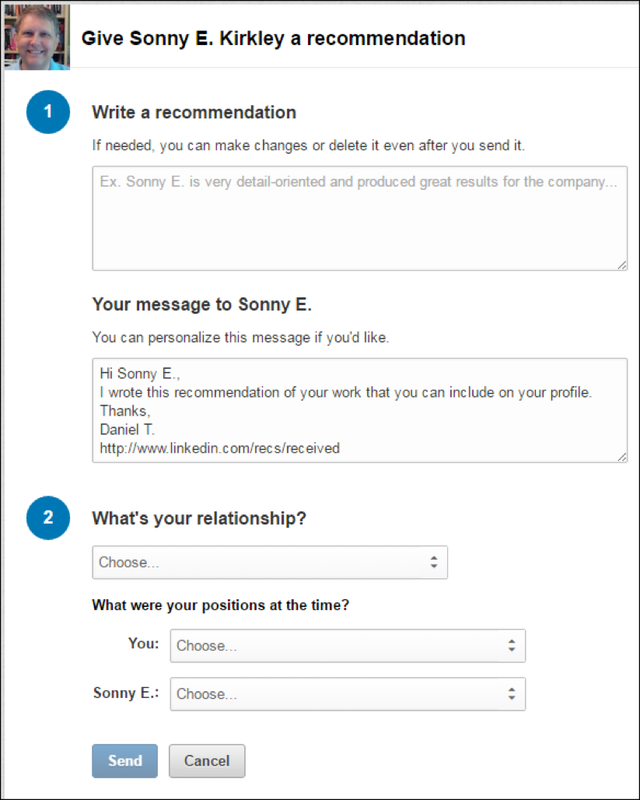 As we saw in the example with Sonny, the public nature of LinkedIn recognitions provides transparency and some assurance that the recognitions are not bogus. LinkedIn stated in 2016 that "more than 10 billion endorsements have been shared” and “people with at least five skills listed on their LinkedIn profile receive up to 17x more profile views.” A widely-cited survey by Jobvite in 2013 revealed that 96% of the professional recruiters reported using LinkedIn to search for candidates, and that 92% of the recruiters reported using LinkedIn to vet candidates before interviewing them. However, the Jobvite survey said nothing about endorsements and recommendations and the data from LinkedIn was strictly correlational (people with more skills are likely more active on the site). A quick search of Google uncovers posts like this one asserting that LinkedIn “trivialized” the meaning of endorsement by making it one click away. But it turns out that the post was written by someone who calls himself the “Get Recognition Right ® Guy” and runs the Recognition Management Institute. …the majority of the participants were active users of their skills section on LinkedIn, and they had endorsed others at least once. The most common scenario behind endorsement was that the person knew about the endorsee’s skills through his or her personal experience. The second most common scenario was that LinkedIn prompts were the reason behind someone endorsing others, especially when they did it as a reply to a previous endorsement of themselves (Rapanta & Cantoni,, 2016, p. 4). The majority of people make and receive endorsements without carefully calculating the epistemic weight of knowledge authority attribution that lies behind the phenomenon of attributing a particular skill to someone. In short, they concluded that the way LinkedIn prompts users to endorse skills and the reciprocal nature of endorsements appears to undermine the authority of those endorsements. If you are endorsed for a skill by someone you worked with who has also been endorsed for that skill by multiple qualified people it counts for a lot more. The rest is just static in the system. This distinction is crucial and LinkedIn appears keenly aware. Delivering endorsements that provide even more value required a blend of research, new machine learning models and re-architecting the backend infrastructure that both serves and recommends new endorsements. These changes to Skills and Endorsements means we can better surface the most relevant endorsements that help validate your skills. 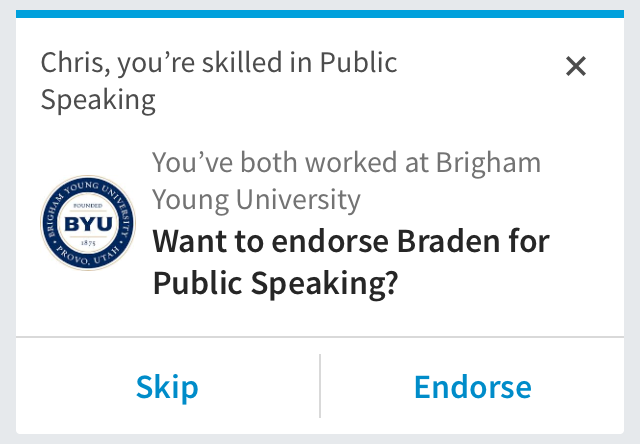 Indeed, when Chris pulled up a former colleague Braden’s profile on LinkedIn’s new mobile app, one of the first things he saw was the message below which concerned a Skill for which Chris had a relatively large number of endorsements. 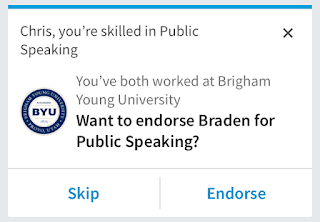 In other words, LinkedIn recognized that (a) Chris and Braden both featured the skill public speaking on their profile, (b) Chris had a relatively large number of endorsements for Public Speaking, and (c) that Chris and Braden had worked together. On one hand this sort of prompting may still diminish the value of endorsements. On the other hand, this should serve to increase the number of valued endorsements from close connections who are also strongly endorsed for the skill. Combined with the new Recruiter tools that order search results accordingly, this promises a Google-style search engine based on recognition of learning. Writers posting recently at Forbes, The Business Journals, and Venture Beat seem convinced that these refinements will increase the value of endorsements. LinkedIn acquired Lynda.com and their thousands of high quality training videos and courses in 2015. Those resources now reside in In Learning which was introduced in September 2016. As we will explore in more our next post, these developments expand LinkedIn from recognizing learning to directly supporting it. 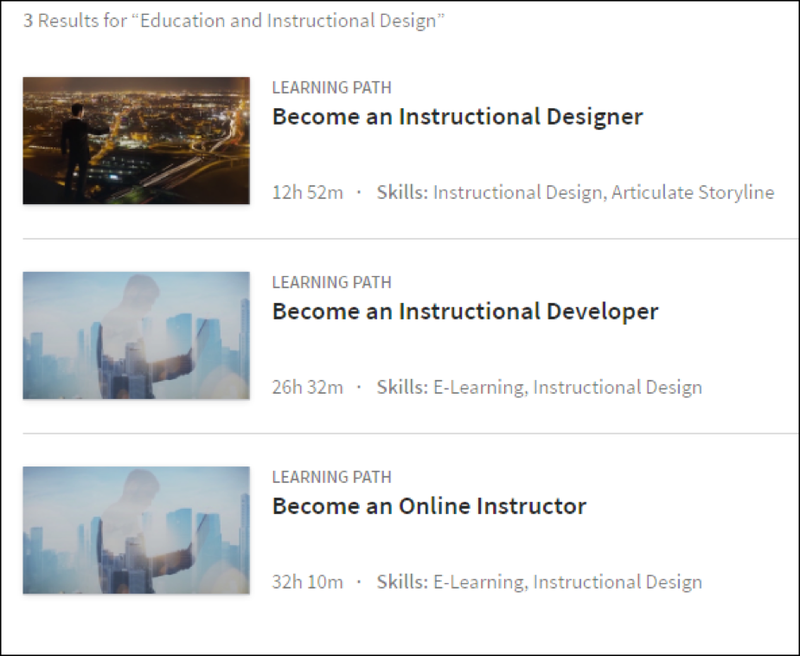 In Learning organizes videos into courses, and courses into “Learning Paths.” Given that the Lynda.com course completion certificates now go directly to a profile page, these developments promise to dramatically increase LinkedIn’s usefulness and use as a learning recognition network. We look forward to exploring this developments at LinkedIn in light of the sub-degree certificates and micro-masters that Dan explored in the second post in this series. Entirely inside of LinkedIn, it is now possible to earn certificates of completion for such pathways, gain multiple endorsements of those skills from knowledgeable connections, and gain one or two recommendations from reputable connections specifically mentioning the use of those skills. While time will tell, it seems like LinkedIn may have the potential to compete with traditional certificate providers (like community colleges and professional associations) as well as newer boot camps and MOOCs. 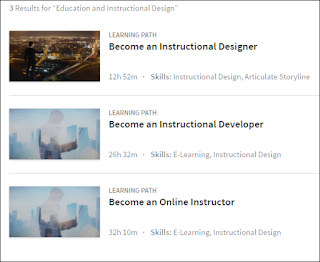 Consider for example, the Learning Path for becoming an online instructor. While the Pathway includes 32 hours of video. Those videos are segmented into assignments and separated by online quizzes. LinkedIn makes a point of saying that their courses are unaccredited and not comparable to face to face courses or community college coursework. 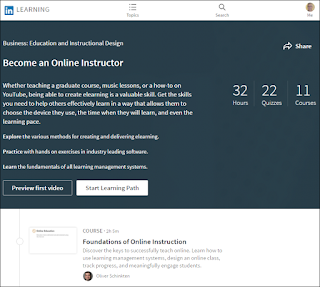 But the Online Instructor Learning Path certainly might be comparable to the $1500 Online Teaching Certificate offered by the Online Learning Consortium. These are certainly exciting developments for education and training. They raise all kinds of challenges and questions about the things that we explore here at RMA. While it will take some time to see whether these two important strands of development at LinkedIn go. As other more specialized LRNs come on line (particularly MyMantl from Chalk and Wire), LinkedIn will look for additional ways to compete. But while working on this post, Dan went ahead and endorsed the skills of a number of connections and accepted over 50 unaccepted connection requests. He also posted a LinkedIn update to promote the previous RMA blog post. Doing so quickly generated six likes in a day and at least hundred new views of the blog. That was promising.